BREAKING NEWS: Another New Partner At Richard Petty Motorsports? A sports management firm owned by a Saudi Arabian Prince has signed a memorandum of understanding with Richard Petty Motorsports co-owner George Gillett that will lead to a commercial partnership involving both the Liverpool Football Club and Richard Petty Motorsports. Gillett and his Liverpool Football Club co-owner, Tom Hicks, confirmed recently that they had begun looking for outside investors, but told the BBC as recently as this week that the search was “at an early stage," and that there was “no agreement with any party." Those statements came just a day after Prince Faisal bin Fahad bin Abdullah Al Saud told reporters that he was negotiating to purchase half of the club for between 200 and 350 million British pounds. Gillett and Hicks purchased he team for 174 million pounds 2007. Gillett recently announced plans to sell the Montreal Canadiens hockey club and their home arena, Montreal’s Molson Centre. While it is not currently known how (or if) the deal will impact the day-to-day operations of Richard Petty Motorsports, the NASCAR Examiner website reports that today’s agreement is the first step in Gillett selling his stake in the team to Prince Faisal. The report states that the “due diligence” process is already underway, and could result in Gillett being entirely bought-out by the end of the 2009 calendar year. A press release announcing the partnership mentions no such sale; only the possibility of developing NASCAR-style racing circuit and Richard Petty racing schools in Saudi Arabia and elsewhere in the Middle East. Richard Petty Motorsports recently announced plans to merge with Yates Racing in time for the 2010 season, and the team declined to have a representative speak with Sirius Speedway today about this latest deal. While most of the championship attention continues to focus on Jimmie Johnson and Mark Martin, Juan Pablo Montoya and DEI-Ganassi Racing with Felix Sabates have inserted themselves solidly into the title debate, authoring a Cinderella story that few could have predicted even a few short months ago. Coming into the 2009 season opener at Daytona, DEI-Ganassi was fresh off a corporate merger that many observers characterized as a reshuffling of deck chairs on the Titanic. Chip Ganassi is a perennial title contender in the IRL IndyCar ranks, but his sole bid for the Sprint Cup title came more than a decade ago with Sterling Marlin at the wheel. DEI, meanwhile, was best known as the team that let Dale Earnhardt, Jr., get away; a move that prompted former series champion Tony Stewart to predict that the team would be “a museum” within 24 months. For his part, Montoya was coming off a 2008 season highlighted by an unremarkable 25th-place finish in points, inciting debate over whether the former open wheel star would ever fully adapt to stock car competition, and whether there was any future at all for DEI-Ganassi. The nay-sayers could not have been more wrong. After a halting start that saw them finish 14th, 11th, 31st and 27th in the first four races of the season, Montoya’s Target Chevrolet team slowly began to right the ship. By the time NASCAR rolled into Charlotte for its annual midseason All-Star festivities, the former Indianapolis 500 champion had climbed all the way to 14th in points and begun to be included on the list of possible Chase contenders. In the last 15 races – dating back to Pocono in June – Montoya went from “possible Chase contender” to “legitimate championship aspirant,” ripping off 10 Top-10 finishes with only one result outside the Top-20. His average finish in that span is 9.5; enough to place him third in points heading to Round Three of the Chase this weekend at Kansas Speedway. Montoya faced criticism in some circles for “points racing” during the final few races of the regular season; eschewing his usual aggressive style in favor of a big-picture-friendly approach that stressed Top-10 finishes over wins. Now, however, the reins have clearly come off. This has already been a coming-of-age season for both Montoya and his team. There is still work to be done at DEI-Ganassi Racing, but JPM's unexpected title bid has given them a solid foundation to build upon. Martin Truex, Jr., will still jump ship at season’s end for a new ride at Michael Waltrip Racing, leaving the team’s #1 Chevrolet vacant. Jamie McMurray is rumored to be waiting in the wings to fill that seat, but the deal (like most others these days) is contingent on the acquisition of a sponsor. Young Jeffrey Earnhardt -- grandson of the late Dale Earnhardt and nephew of Dale, Jr. -– is being touted for a full season of Sprint Cup competition as soon as 2011, but is currently an unproven commodity whose resume is highlighted only by a partial season of Camping World Series East racing two years ago. But the future is just that, the future. For now, DEI-Ganassi Racing can take pride in proving the doubters wrong. They have not only survived, they have thrived; arguably outperforming more traditional NASCAR juggernauts like Richard Childress and Roush-Fenway Racing. That’s something to be celebrated, and it’s not over yet. With those horrible white shades, the logo on the firesuit says it all! Richard Petty Motorsports’ Executive Director of Race Operations Robbie Loomis says the team could field a Ford Fusion before the end of the 2009 season. Loomis told FoxSports.com’s Lee Spencer, “I don't want to talk about things that are pure speculation, but I don't think it would surprise anybody if we did.” A spokesperson for RPM told Sirius Speedway today that there are no plans to field a Ford before 2010, but off the record, sources inside RPM say that the team has already built at least one Ford Fusion, installing a Ford powerplant in an existing RPM chassis. Initial plans were to have AJ Allmendinger debut the car at Kansas Speedway next week, but that timetable was pushed back when Roush-Fenway Racing's Jack Roush expressed reservations about the quick ramp-up. Now, tentative plans call for Allmendinger to drive a Richard Petty Motorsports Ford at Talladega Superspeedway on November 1, with additional outings possible -– though not certain –- at Texas, Phoenix and Homestead-Miami Speedways. Calls to Richard Petty Motorsports seeking comment were not immediately returned. Loomis also confirmed today that Reed Sorenson is not the first RPM driver to race for free, saying that Allmendinger also waived his paycheck for a time, in order to remain on the racetrack. In addition to visiting our wounded military men and women at Walter Reed Medical Center in Washington, DC, Ryan "Rotten Egg" Newman took a few minutes off to bust the Godfather's stones in a Thursday phone interview. Thanks, Newman! Jimmie Johnson criticized NASCAR’s decision to delay throwing the caution flag when AJ Allmendinger spun on the final lap of Sunday’s Sylvania 300 at New Hampshire Motor Speedway. The yellow flag did not fly until the leaders were between Turns 3 and 4, and Johnson said yesterday that an unsafe situation resulted. “It should have been called a little bit earlier," he said. "On the last lap, when you take into consideration how fired up everybody is to get back to the start-finish line…that bit of hesitation in all the drivers' minds leads to an unsafe situation." NASCAR officials say they delayed the call hoping that Allmendinger would be able to refire his car and allow the race to end under the green flag. No Appeal For JGR: Joe Gibbs Racing has responded to the penalties levied aganst them by NASCAR after the left-front corner of Kyle Busch’s car was found to be too low in post-race inspection Sunday. A JGR press release said the infraction stemmed from a dislodged left front spring that required the team to make major adjustments to the car's suspension during the race. The team said it accepts the penalty, and will not appeal. Testing Restraints Loosened: NASCAR has announced its 2010 testing policy for the Sprint Cup, Nationwide, Camping World Truck and Camping World East and West Series; once again prohibiting testing at tracks that host any of those series. However, testing will be allowed next season at NASCAR-sanctioned tracks that host regional touring races, but not national series events. Based on this year's schedules, testing would no be allowed at Greenville-Pickens, Tri-County, South Boston, Thompson, Music City, Adirondack, Lime Rock, Thunder Hill, All American, Madera, Douglas County, Toyota/Irwindale, Portland, Miller Motorsports and Colorado National Speedways. RPM Changes Engines: In the aftermath of a broken crankshaft in last Sunday’s race at New Hampshire Motor Speedway, Richard Petty Motorsports will use the R5 Dodge engine under the hood of Kasey Kahne’s Budwesier Dodge this weekend, rather than the newer R6 powerplant. Kahne has been using the R6 for a number of weeks, but periodic issues with crankshafts have prompted them to resort to the older engine. RPM’s trackside engine supervisor, Bill Pink, said new, stronger crankshafts will be ready for next weekend’s race at Kansas Speedway. Kahne was sidelined just 66 laps into Sunday’s race, finishing 38th. He now sits 12th in the championship standings, 161 points behind leader Mark Martin. Richard Petty Motorsports is a team in turmoil. Kasey Kahne admitted this week that he has no idea who is running the show there these days; a viewpoint that is shared by just about everyone inside the walls at RPM. Managing Director of Competition Mark McArdle is gone; fired last week after a heated verbal confrontation with team owner George Gillett. Employees of the team’s engine shop are jumping ship like fleas off a wet dog, anticipating layoffs that will soon add more than 60 names to the unemployment dole. Was it bad karma when Kahne exited Sunday’s race with a blown engine after just 66 laps? Or something more ominous? Carl Edwards’ broken right foot hurts much less than the performance of his Roush-Fenway Racing Fords these days. Jack Roush’s teams -– all five of them -- have lost a few mph off their fastball this season, and not even a savvy crewchief like Bob Osborne can manufacture enough Top-5 finishes to make Edwards a championship contender. 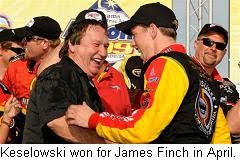 Crewchief Pat Tryson is leaving Penske Racing at the end of the season to take a position with Michael Waltrip Racing. 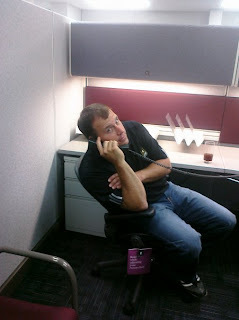 As a result, he is no longer welcome in the Penske shop, or at the team’s weekday strategy meetings. That’s no way to win a championship. Tryson’s driver-for-now, Kurt Busch, had a strong start to the Chase in New Hampshire Sunday, but he’ll be hard-pressed to maintain that momentum. A house divided cannot stand. Tryson went out of his way Saturday to tell reporters that his departure from the team is not the result of a poor relationship with Busch. That came as a surprise to those familiar with the pair's raceday radio communication; conversations that are often (how do we say this politely?) a bit strident. Juan Pablo Montoya is 0-for-26 this season, and it’s going to take at least two Chase victories (probably three) for anyone to claim the title. 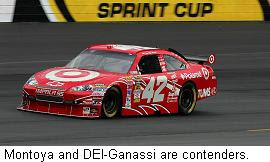 Unless DEI-Ganassi rediscovers the way to Victory Lane, Montoya and company will not mount a serious challenge for the championship. Jimmie Johnson says his team is stronger today than it’s ever been. If he’s right, I’m missing something. The three-time and defending Sprint Cup Series champion seldom gets the credit he deserves, but he and the Lowe’s Chevrolet team do not appear to be the dominant force they were a year ago. Coming into the weekend, Jimmie’s average finish over the previous six races was a downright pedestrian 18.8; a far cry from the fifth-place average he posted in the 2008 Chase. He hasn’t won since Indianapolis Motor Speedway in late July, and to me, it looks like the genie has finally slipped out of Chad Knaus’ bottle, at least temporarily. Tony Stewart’s bid to become the first championship owner/driver since Alan Kulwicki in 1992 has been nothing short of inspirational. But he’s still got a lot of work to do. The flow of information and technology from Hendrick Motorsports will almost certainly ebb as we approach the season finale at Homestead-Miami Speedway, and while Stewart is second-to-none as a driver, he may find it impossible to beat Rick Hendrick with his own stick. Sources within Hendrick Motorsports tell me that a combination of chiropractic therapy and stretching exercises has four-time Sprint Cup champion Jeff Gordon feeling better than he has in months. If his ailing lower back allows it -– and I’m thinking it might -– Wonder Boy will make a concerted run for title number five. In the end, though, I see Gordon coming up just a few points short of 50-year young Mark Martin in the battle for the 2009 NASCAR Sprint Cup. No team is more focused on the job at hand than Alan Gustafson and the #5 Kelloggs/Carquest Chevrolet bunch. They’ll get the best equipment and information Hendrick Motorsports has to offer, and Martin has the ability to offset a mediocre finish or two with multiple Chase victories. Other teams have been hotter at times, and others have been more consistent. But Martin looks like a man of destiny, and I’m predicting that 2009 will finally be his year. Red Bull Racing will remain a Toyota team in 2010 and beyond, after announcing a renewed manufacturer alliance for its two NASCAR Sprint Cup Series teams. Red Bull had negotiated with Chevrolet, before team management elected to remain in the Toyota camp. Team General Manager Jay Frye said Toyota has been a critical element of Red Bull's success, and that he is looking forward to continuing the relationship. In other manufacturer news, published reports today say that Rusty Wallace Inc., will convert its two-car NASCAR Nationwide Series team from Chevrolet to Ford next season. Sources close to the team say the move results from Chevy’s recent reduction in financial support to the series, and that the team’s current inventory of cars – driven by Steven Wallace and Brendan Gaughan – are currently for sale. RWI jumped to Chevrolet from the Dodge camp in 2008. From The "We Told You So" File: ESPN.com reported today what Sirius Speedway first told you Monday, that Richard Petty Motorsports has fired Vice President and Managing Director of Competition Mark McArdle in the aftermath of last Friday’s verbal confrontation with team co-owner George Gillett, Jr.
McArdle was suspended immediately following the incident, and was given his outright release Monday. Officials of Richard Petty Motorsports have not commented on McArdle’s dismissal this week, but Petty himself said Saturday that he believed McArdle had already been fired. ESPN.com’s David Newton reports that a recorded message on McArdle's cell phone said that it has now been repossessed by the team. No Double-Dip For Seuss: NASCAR Whelen Modified Tour star Andy Seuss will not attempt to do double duty at New Hampshire Motor Speedway and North Carolina’s Caraway Speedway Saturday, after all. The opportunity to run the ironman doubleheader arose after a Southern Modified Tour event at Caraway rained out earlier this season and was rescheduled for Saturday; the same day as the Northern Tour is set to compete at NHMS. Seuss initially considered attempting both events, but travel concerns have prompted him to turn the wheel in his #70 modified over to Camping World East Series driver Eddie MacDonald, in order to concentrate on the Caraway event. Seuss and MacDonald are longtime friends who began their racing careers at the Lee USA Speedway in New Hampshire, a track owned by MacDonald's family. MacDonald has only one career Modified start, but won both Camping World East Series races at New Hampshire last season. He will now do triple-duty in the Granite State, running tomorrow’s Camping World East race, in addition to Saturday’s Modified and American-Canadian Tour Late Model races. In other Modified news, Kasey Kahne has withdrawn from Saturday's race at New Hampshire to concentrate on his Sprint Cup effort. He was scheduled to drive the same H&H Motorsports car he ran last month at Bristol Motor Speedway. Richard Petty Motorsports Vice President Mark McArdle has reportedly been fired after what sources called a “heating shouting match” with team owner George Gillett at Richmond International Raceway Friday. Team spokesmen will confirm only that that McArdle has been suspended through this weekend's race at New Hampshire Motor Speedway, but sources tell Sirius Speedway that he has already been fired. Gillett said this weekend that McArdle’s termination was "the subject of discussion," while co-owner Richard Petty said McArdle has, in fact, been terminated. McArdle also serves as RPM’s Managing Director of Competition -- overseeing the team’s engine and chassis departments -– and his dispute with Gillett reportedly centered on the future of RPM’s engine shop. Gillett reportedly met with employees less than 30 days ago, assuring them that their jobs were secure and that there were no plans to close the engine facility. Late last week, those same employees learned that RPM’s engine department will be shut down and most of their jobs eliminated, once the team begins utilizing powerplants from the Roush-Yates engine alliance in 2010. Petty spoke candidly about the planned RPM/Yates merger this weekend, saying the deal should be finalized within the next 2-4 weeks. While the agreement has officially been termed a merger, Petty said it is actually a case of RPM absorbing Yates Racing. He revealed that the entire operation will move to the current Yates Racing shops in Concord, NC, with Robbie Loomis heading the day-to-day operations. Petty said the decision to move to the Ford camp next season came down to Dodge’s inability to make concrete financial commitments beyond the end of the 2009 campaign. Ford Motor Company has already committed to a financial support package for two Yates Racing entries in 2010 and beyond, and Petty said he hopes that deal can expand to include the entire, four-car operation once the economy rebounds. While no decision has been made on which RPM driver will steer the legendary #43 car next year, Petty said he hopes to convince team sponsors to put AJ Allmendinger in the seat. In a related story, Roush Fenway Racing President Geoff Smith said this weekend that he is scrambling to find a new home for the No. 26 Ford now driven by Jamie McMurray. Prior to the RPM/Yates merger, negotiations were underway to move the team to Yates Racing next season. But with that team now at NASCAR’s four-car limit for 2010, other arrangements will have to be made. The #26 car also lacks sponsorship for next season, and with the future of the team in doubt, McMurray has reportedly ramped-up his talks with Earnhardt-Ganassi Racing to replace Martin Truex, Jr., in that team’s #1 Chevrolet next season. 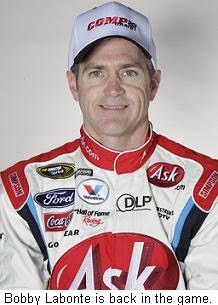 Bobby Labonte is also said to be a candidate for that ride. Jeremy Mayfield told ESPN's "Outside The Lines" yesterday that NASCAR is using him to scare his fellow drivers straight. Mayfield said his May 9 suspension for violating the sanctioning body’s substance abuse policy was an attempt by NASCAR to “get the message back to other drivers in the sport, (and) to put the fear of God into them.” He said his suspension “killed two or three birds with one stone, and put the fear of God in other people and other drivers who have tested positive that they didn't put in this situation." Mayfield’s lawsuit against NASCAR is scheduled to go before a jury next September, and NASCAR spokesman Ramsey Poston said of Mayfield’s latest comments, "The facts are clear and now recognized by the court, that Jeremy tested positive twice for methamphetamines. He was offered the chance to undergo the road to recovery but chose to go the legal route." As Promised, Suzy Q's Steamy Poolside Cheesecake Photo! 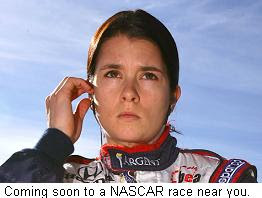 Published reports say that that Danica Patrick will race in NASCAR’s Nationwide and Camping World Truck Series next season, as part of a deal with NASCAR Sprint Cup Series point leader Tony Stewart. ESPN.com quotes unnamed sources saying Patrick will run "a significant number" of Nationwide races in 2010, in addition to a full-season of IndyCar racing with Andretti-Green Racing. 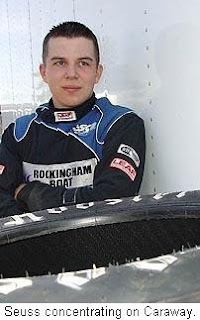 In addition, Patrick will see seat time in both the Camping World Trucks and ARCA, possibily beginning with an ARCA start at Speedweeks 2010 in Daytona. Stewart-Haas does not currently compete in Nationwide or Trucks, meaning that a third partner will almost certainly be needed to consumate the deal. While Dale Earnhardt, Jr.'s JR Motorsports has been mentioned as a possible candidate, Sirius Speedway has learned the Kevin Harvick Inc. is likely to provide the machnery for Patrick's stock car effort. Stewart has not commented specifically on any plans he might have with Patrick, but said, “I know that she's serious about (NASCAR). I know that's what she wants to do. I don't think she has some misguided idea that it's going to be easy to do it. She wants to do it the right way. She has the intentions of doing everything right and she's…come to us to see our opinion about how she should go about it." Stewart also confirmed that there will be no third Stewart-Haas Sprint Cup team next season, explaining that sponsor and driver negotiations did not progress quickly enough for the team to consider adding a third Chevrolet for 2010. Chevy Committed To NASCAR: Chevrolet’s Brent Dewar said Saturday that the automaker is in NASCAR to stay. Dewar was at Atlanta Motor Speedway to assure Chevy teams that factory support will continue at its current level through at least 2010, and that the total number of drivers and teams will not be reduced. In addition, he said he hopes to be able to increase support in time for the 2011 season. "We've been in it from the beginning, and we're in it for the long haul," he said, adding that the concept of "race on Sunday, sell on Monday" still applies and that GM continues to see a positive return on its investment in the sport. Eury Happy At HMS: Tony Eury Jr. said Saturday that he will remain with Hendrick Motorsports in 2010, despite a recent visit to Richard Childress Racing, and a Charlotte Observer report that he could join Brad Keselowski at Penske Racing. Eury is in the second year of a five-year deal with Hendrick, and downplayed the visit to RCR, saying, "Who said I wasn't up there just to tour the museum?" 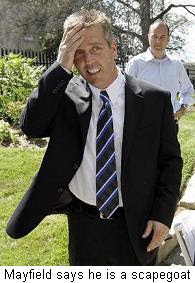 More Trouble For Mayfield: Jeremy Mayfield’s problems continue to multiply. Mayfield is now being sued by Arrington Manufacturing for a $71,000 unpaid engine bill stemming from races he took part in earlier this season. A complaint filed last week in North Carolina Superior Court alleges that Arrington provided engines to Mayfield Motorsports at Phoenix, Talladega, Richmond, Darlington, and Charlotte, in addition to the Sprint Showdown on All-Star Weekend. Compensation was based on how many miles were run in each event, and while Mayfield paid for the Phoenix and Talladega races, Arrington alleges that he has not paid for the other four events. The company seeks the $71,000 it says it is owed, plus attorneys' fees. Mayfield is also being sued by Triad Racing Technologies for more than $86,000 in unpaid bills, and faces a defamation of character suit filed by his former stepmother, Lisa Mayfield. Former Sprint Cup Series champions don’t usually sit on the sidelines for long. Just days after Bobby Labonte had his schedule with Yates Racing trimmed by seven races in favor of youngster Erik Darnell, the 2000 series champ has inked a deal to drive the TRG Motorsports #71 TaxSlayer Chevrolet in those seven events. 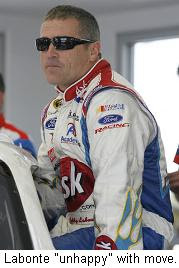 Labonte will be in the car this weekend at Atlanta Motor Speedway, keeping his lengthy consecutive-race streak intact. David Gilliland will drive the #71 car in the races Labonte does not run. TRG owner Kevin Buckler said recently that he would like to expand his operation to two cars next season, and with the Labonte/Hall Of Fame Racing/Ask.com tandem unlikely to renew its deal with Yates Racing for another year, the possibility exists for TRG to step in and fill the void. The move puts Labonte on the list of Past Champion’s Provisional-eligible drivers for this weekend’s race, along with older brother Terry (the 1996 and 1984 champion) and Bill Elliott, who wore the crown in 1988. JRM In Driver Search: JR Motorsports spokesman Mike Davis says several drivers are being considered for the team’s two NASCAR Nationwide Series teams in 2010. 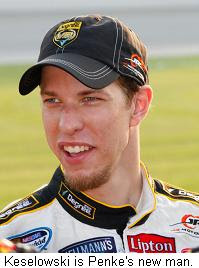 With Brad Keselowski moving to Penske Racing next season, the seat in the #88 Chevrolet will be vacant. And while Kelly Bires is widely reported to be the leading candidate for that ride, Davis declined to comment on specifics of the search. 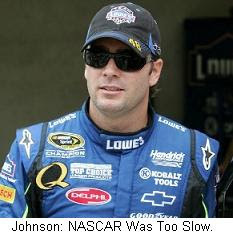 He did say that Jr Motorsports would like to run both the #88 and #5 teams will full-time in 2010, pending sponsorship. Dale Earnhardt, Jr. will drive the #5 in several events. Kahne Suit Dismissed: The lawsuit filed by a Homestead-Miami Speedway security guard against driver Kasey Kahne has been dismissed. 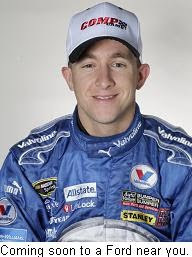 Security guard Archibald Hutchinson alleged that Kahne shoved him to the ground during the final weekend of the 2007 season at Homestead, leaving him with injuries that prevented him from working. 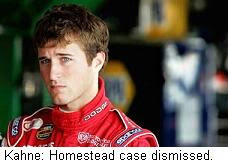 Kahne maintained his innocence from the outset, and a misdemeanor battery charge was dismissed back in June. Miami-Dade County court records show that Hutchinson’s civil suit against both Kahne and NASCAR was dismissed on August 24. Youth Movement Continues: NASCAR is lowering its minimum age requirement for competition at NASCAR Whelen All-American Series tracks, beginning next season. The sanctioning body announced that it will introduce a "Learner's Permit License" for drivers as young as 14, dropping the minimum age from the current 16 years of age. The NASCAR Whelen All-American Series awards national championship points at more than 55 short tracks across North America, with over 10,000 drivers taking part each year. Penske Racing made it official earlier today, announcing that Brad Keselowski will drive the #12 Penske Dodge full-time in 2010, replacing David Stremme. Keselowski will also run for the championship in the NASCAR Nationwide Series for Penske. Team owner Roger Penske made the announcement this morning, saying, "We are very excited to welcome Brad to the Penske Racing family. Brad has shown terrific success on track the past several years, and has quickly established himself as one of the top young stars in racing. He comes from an impressive family background in motorsports. He is a proven winner and a welcome addition to our team." Keselowski claimed his first career Sprint Cup win at Talladega Superspeedway in April, driving for Phoenix Racing. He has three top-10 finishes in eight Cup starts this season, and those eight races make him ineligible for Raybestos Rookie of the Year consideration in 2010. 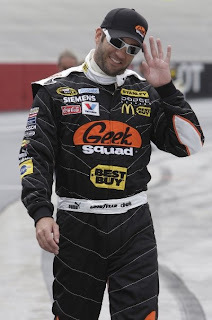 He ranks third in Nationwide Series championship points with three wins. His most recent victory came at his home track, Michigan International Speedway, earlier this month. "Penske Racing is one of the top teams in all of motorsports and I am honored to join Roger Penske's organization and compete for wins with his Cup and Nationwide Series teams," said Keselowski today. "This is a great opportunity for me to continue competing in the Nationwide Series and to run my first full season in the Cup Series with a strong and experienced team." There is no word on Stremme's plans for 2010, and no announcement on how Keselowski’s 2010 Nationwide plans will effect Penske’s current driver in that series, Justin Allgaier. Keselowski will join us today at 3:15 to discuss his new deal in an exclusive Sirius NASCAR Radio interview. Labonte Unhappy With Yates Ouster: Bobby Labonte’s streak of 568 consecutive NASCAR Sprint Cup Series race will end this weekend at Atlanta Motor Speedway, when the seat of the Yates Racing #96 Ford will be filled by newcomer Erik Darnell. Yates Racing co-owner Max Jones announced the move yesterday, saying that Darnell will run the car in seven of this year’s final 12 races due to a lack of sponsorship for Labonte. The former Sprint Cup Series champion’s consecutive race streak began in February of 1993 at Daytona International Speedway, at the wheel of Bill Davis Racing’s #22 Maxwell House Ford. Labonte ranks second only to Jeff Gordon, who has now started 569 consecutive races. The decision to substitute Darnell for Labonte was a no-brainer in these difficult economic times. Labonte’s deal came together in late December – literally the eleventh hour -- when Hall Of Fame Racing determined that its Ask.com and DLP HDTV sponsorships were not enough to finance a full season of competition. HOF found itself with sponsors and no racecars, while Yates Racing had racecars, and no sponsorship. It was a match made in heaven, as far as it went. Unfortunately, the team’s performance was not good enough to attract sponsors for the remainder of the schedule. The 45-year old Labonte managed just one top-10 finish this season, and Yates Racing was unable to secure backing for seven unsold races at the end of the season. When the opportunity to put a fully funded driver in the car presented itself, Labonte’s fate was sealed. New Backer For Baldwin: Wave Energy Drink will sponsor Tommy Baldwin Racing's #36 Toyota and driver Patrick Carpentier in six NASCAR Sprint Cup Series races this season. Wave Energy Drink will grace the team’s quarterpanels at Atlanta, Richmond, New Hampshire, Dover, Kansas and Auto Club Speedways.